Just a month ago I moved into my van full time – by choice – and this will be my first test of living the van life on the road (so far I’ve stuck to Portland, getting the van ready). I’ll be sharing my journey and everything that I’m learning from it via a daily vlog (follow along here if you’re interested!). The conference I’m going to is all about storytelling – a craft that I’ve become more and more interested in the past few years because it directly relates to the work I do at Verbal To Visual and Learn In Public. As a teacher I want to tap into the power of storytelling to create more impactful learning experiences. Capturing the trip via a daily vlog will be another way to practice my storytelling skills before the conference, and then put into practice what I learn from it! 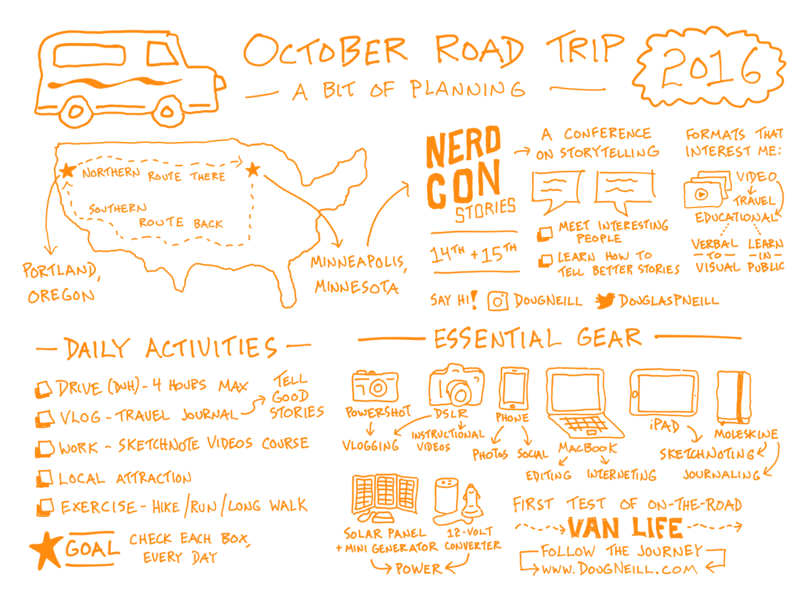 I’m also looking forward to connecting with folks along the way – strangers that I meet on the road and conference attendees who are as excited to nerd out on storytelling as I am.